I remember my grandmother using homeopathy remedies and natural remedies to help us when we were sick. But as an adult, my personal journey in holistic medicine began when my first son was born. That child was born extremely sensitive to my breast milk and we quickly had to change our diet to keep him rash and belly pain free. As he grew, I noticed how much sugar affected his behavior and mood as well as lactose. My journey went deeper in that area with the birth of my second son who had more sensitivities than my first, or at least they were more obvious. Visits to our pediatrician made everything worst, not better. He was not sick, therefore medicine was not needed, but he also was not well. He was swollen all the time, feeling foggy, belly aches continuously. This made his life and ours miserable. It was clear something was wrong, and I had to do something. 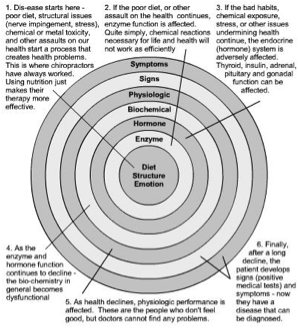 So I went to a naturopath who started by explaining the circle of health to me. A first in a series of moments that have changed our lives. Holistic health is a concept in medical practice upholding that all aspects of people’s needs, psychological, physical and social should be taken into account and seen as a whole and operate as one interpenetrating and co-operative system. What affects one area affects the others, and being aware of how this happens will help a great deal in achieving a wholesome balance. Contemporary Holistic practices tend to promote prevention instead of intervention. Holistic health is based on the idea that disease invades a body that is not healthy. The model below was developed by Dr. Emanuel Cheraskin in his book Predictive Medicine. For a body to be healthy there must be good genetics, good structural balance, good nutrition, biorhythmic integrity and good emotional health. When these base components are not present, it sets the stage for disease. It is believed that disease begins when the body is unhealthy. It begins with poor diet, emotional issues, chemical or metal toxicity, and/or structural issues such as nerve damage, poor body function or stress, assaulting the body. This model addresses the basic needs of an individual but the 21st century world requires that we consider a few other elements in order to remain or become healthy. In our century, the meaning of the term health takes on a multitude of dimensions that, before attempting to discuss the role technology can play in our health, I must look at and dissect what the meaning of health is in our culture. Nourishing ourselves in this beginning of the 21st century cannot be limited to food. Our health is now dependent on other elements, some that used to be recognized in older traditions and others that are unique to our modern times but all affect us greatly: our senses, genes, time, space, animals, plants, elements and technology. The body is a sensory system, our eyes, ears, mouth, nose, and skin are sensors which take inputs from our surroundings which the body processes and reacts via chemical reactions which change our hormonal balances. The interplay between our bio-chemical body, our memories and perceptions and our emotions creates our sense of reality, how we understand ourselves, others and the world. For instance, on the negative side, I have noticed that one of my children has food allergic reactions to wheat that triggers a depressive state that will last three days. And visa versa, a strong stressful reaction will give him belly-aches and depress his immune system, making him more sensitive to food or environmental potential toxins. Interestingly, I have also notice that when we eat well, the interplay moves me into much more positive perceptions of the world. Now that I no longer drink coffee, tea and no longer include stimulants in my diet, a simple apple or a cup of berries can help me attain a deep sense of contentment. And of course, the more this happens, the more I become aware of my sensorial surroundings. This leads me to think that the body, mind connection is affected by toxins. When the body is busy fighting toxins, it cannot let the mind wonder. All the body’s energy and systems are used to fight the effects of toxicity. While when the body is clean, energy can be more readily distributed to all the senses and a conscious way to listen in a much deeper way and to become alert of the various messages our body as well as other people and the environment are constantly sending. I move from a shallow sense of smell, taste, touch, see, hear and experience towards a much deeper kind which makes me notice things I could not before. I become more self-aware, which in turn, allows me to be open to the outside world instead of constantly closed to sensory, emotional and chemical inputs. It is as if we have a narrow and broader sensory focus capacity. This reminds me of a report I heard on the CBC a few years back. Researchers have found that when outside of the city, people seem to be much more able to relax and concluded that in order for our brain to relax, we need to have a clear horizon point. If I recall correctly, the researchers were discovering that we cannot enter a full resting mode without our eyes being able to “defocus”. Interestingly, in holistic health, vision is understood a having three components: Physical eyesight, Inner vision and Emotional seeing. (http://www.healthy.net/Health/Essay/The_Three_Factors_that_Affect_Your_Eyesight/1108). According to Martin Sussman, a holistic vision specialist, Inner vision is the Mind’s Eye in all its different aspects: imagination, visualization, memory, dreams and attitudes and Emotional seeing speaks about our recognition of the eyes as both a way to express how we feel and a way to connect to other people. The eyes are so often called “the windows of the soul”. Given this interconnection between the sensor, physical and emotional health, this seems logical that the eye need diversity in types of focus to issure that our eyesight remains healthy, and a pathway to inner health, clarity and focus and a barometer of our total consciousness. The same could be argued about though processes, the more we use computers and other visual based technology to work, the more our thinking become “short focused”. When reading a book on paper, our mind enters a more “deep focused” state, using imagination instead of predesigned images to create meaning. This seems to allow us to enter a type of reflective state which in itself becomes a type of meditation. In this case by defocusing our inner mind, we wonder and move into creative thinking spaces. In our culture, this wondering mind has been stigmatized as negative. According to R. Fisher, in the New Scientist editorial “Daydream your way to creativity ” of June 2012: “Sigmund Freud considered such zoning out “infantile”; others feared it could lead to psychosis. Today, we know it is instead the sign of a healthy mind, allowing us to plan for the future by imagining different events, for instance. One particular virtue might even transform how we work, teach children, operate business and nurture ideas. So, both type of mental activities are important. At the other end of the spectrum, Short focused thought also allow for a meditative state to be achieved but it does so my increasing the intensity and speed of thoughts. In this case by hyper-focusing we reach a highly rational type of meditation, which helps innovate within a technological context. Imagination comes alive when we give ourselves mental space, while when we hyper-focus we have entirely closed ourselves to external and internal diversity. The world of sensory integration is fascinating. It is now clear to me that we are all on the same sensory spectrum. But some of us need high level of stimulations in some areas and full disengagement in others. For instance, in my family we are all a blend of introverts and extroverts. The introverts have highly analytical minds and need mental and sensory rest to feel well. They hyper-focus and social life is a distraction that is often painful. They shut out input when it is too intense and eventually get angry when overwhelmed. They turn off the communication system to not feel what others feel. They behave like porcupine who push people away to not feel their emotions and their pains. The extroverts on the other hand, have wondering minds and need a lot of positive sensory, emotional and physical interactions with others and the world in order to feel complete. When they get overwhelmed, they act it out, letting out the energies they need to eliminate. They increase the volume of their communication system to demonstrate what they feel. They run away from the overstimulation. This interplay is very important and in my experience. I cannot begin to be with others until I am aware of my sensorial, physical and emotional self. And for me to be healthy, I must be able to exist in these dimensions. As soon as we introduce the notion of senses and emotions in how we think of health, other dimensions of perceptions must be taken in consideration. « There is a western sensory tradition!